Located in the heart of St. Stefano di Sessanio, in a 15th century palace, 'La Bifora Le Lune' offers a panoramic view of the surroundings. St. Stefano di Sessanio is ideally positioned to visit the Abruzzo region. This region is situated with the Marche to the North, the Lazio to the West, Molise to the South and the Baltic Adriatic to the East. Sight seeing opportunities such as the 'del Gran Sasso Monti della Laga' national park, L'Aquila and Campo Imperatore are only a few kilometers away. The Bed and Breakfast is a family run villa, offering a multitude of rooms. Breakfast is prepared in itatian style by the owner, and served in a bright and stylish salon. 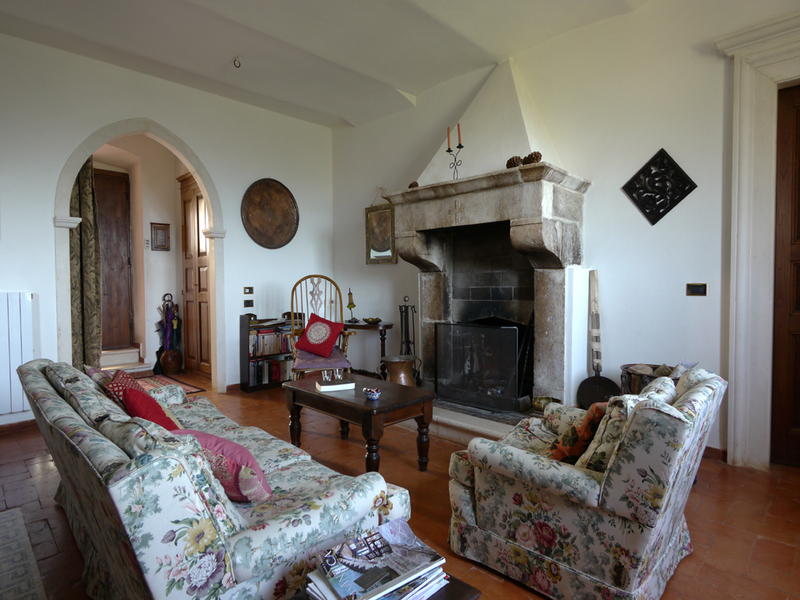 Since the villa was in the distant past owned by the ancient Florentine 'Piccolomini' family the crest is still evident above the fireplace. Guests are served with local specialties such as homemade italian bread, salami, cheeze and sweet homemade pastries. All are naturally accompanied by Itallian coffee, tea, fruits and juices. The guest rooma are spacious, quiet and furnished in a stylish fashion. 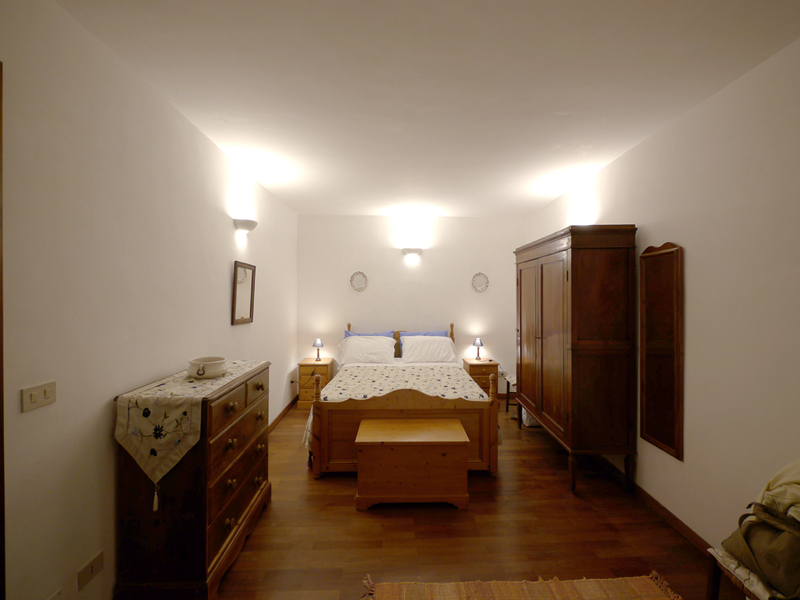 Each room is equipped with heating and the acommodation of children and/or pets is possible. The bathrooms are large and well lit. 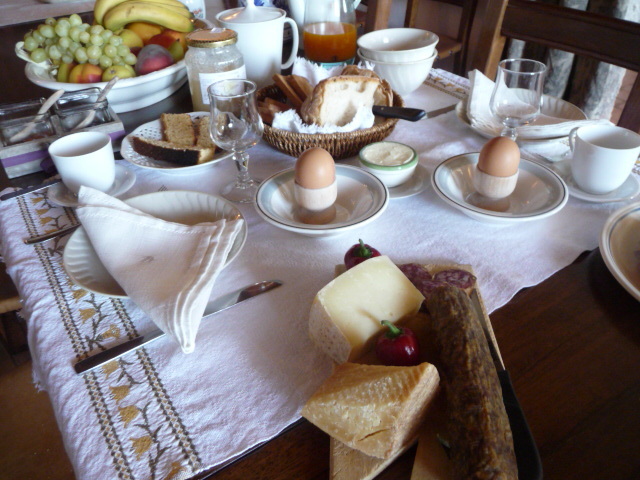 The food prepared for you in the bed & breakfast is home made and often organically grown. Ingredients are fresh and local. Your hostess takes pleasure in preparing all sorts of meals, pastries and other delicious foods. Head for the highway A24 (direction Roma uscita Bussi-Popoli). Follow ‘L’Aquila’ and and after that follow Barisciano. After this follow signs to S. Stefano di Sessanio. Head for the highway A24 direction L’Aquila, exitL’Aquila east. Continue to Pescara and follow signs Barisciano and S. Stefano di Sessanio. Nature lovers will be able to do some wonderful walking, cycling or riding horse. One can even make trips with skis or snowshoes in the wintertime. There are great sceneries to enjoy and one can find rare or unique flowers such as the Adonis Vernalis and Goniolimon Italicum. 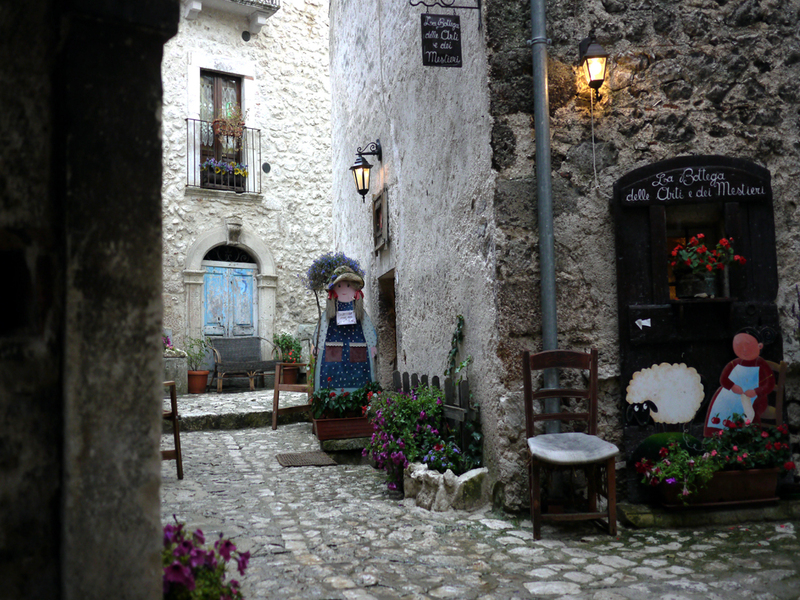 There are several medieval villages in the area that can be visited which are still well preserved. From Santo Stefano there are numerous marked trails, providing easy access to the ancient towns of Rocca Calascio, Castelvecchio Calvisio and Castel del Monte. They also lead to the highlands Locce, Campo Imperatore and Gondole. After a short drive there are the main roads leading to a larger part of the Gran Sasso, to Sirente Velino river Tirino, where you can go canoeing. For those who are interested in history or art are visits recommended to places such as L’Aquila, Sulmona, the painted churches of Bominaco, Septic, Bazzano, Capistrano, several archaeological sites and caves of Peltuinum Stiffe. In the area you can take lessons in horseback riding, individual rides or do yoga. All this without forgetting the delicious food mostly made from local products. Breakfast is to a large extent made up of many of these local products. Also, various high quality products can be tasted and bought from local producers. Some local products are grown according to the principles of Slow Food. The people of Labiforelalune can tell you more. Inside the B & B is a small store with various items of farming under the Slow Food predicate such as extra virgin olive oil, jam, corn flour, quarantino, legumes such as lentils everything produced in Santo Stefano di Sassanio also there can be obtained Aquila saffron. Slow country o Slow life Our is the philosophy of beauty. Our guest must be imbued with beauty that is around us. The mountains metaphysical and essential, Giottesque and Tibetan. The Campo Imperatore and the Gran Sasso: to experience them, to see them is an emotion that expresses the kind of feeling of loneliness that comes to us with regard to the grandeur of nature. And the breath of the old culture, a stone village, the old tower with battlements signed by the earthquake, the medieval streets. Fields as painted by an impressionist or pointillist painter or directly by Giotto himself: his long stripes of land, green, brown, colors and floral art. A heroic agriculture survives in the windswept highlands with its strong and blinding light. The choice of natural and slow crops. The plants grow tedious and as far as possible they produce natural seeds. There grow almost wild lentils, chickpeas, grass peas, archaeological wheat, barley and spelled. The fort Calascio looks down on everything, hard but soft at the same time as a castle, a vision, a sense of light ocher can be. The trips to Campo Imperatore, Gondole, Locce, the Valle Francuccia, at Prata, the valley of the Valley Voltigno Strina, are like time traveling in the breath of the wilderness as a natural garden. Climbers climb the ledges and ‘alpine towers’ of the Apennines. Apennines also reminiscent of the sea which is very near with her breathing she gives taste to the Mediterranean wind that will blow. Finally, our accommodation of stone, with Bifore windows in 15th century style, breathe the scent of Siena and Florence, which Santo Stefano was in a feud, the atmosphere of Rome, which remains the region Abruzzo L’Aquila drenched by the geographical proximity of a strong story. In short, the mystique of the Romanesque churches, arid valleys, of medieval paintings, the colors of the land, a land of flavors and slow and far away. Slow life.